Increased energy level and lower fatigue. Help to regulate calcium and blood sugar levels. Reduce the effects of aging due to its powerful antioxidants. Enhanced mental and physical wellness. Provide the required amount of 23 essential vitamins and minerals your body needs but not always gets. 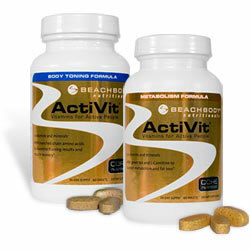 Activit Multivitamins comes in 2 formulations to better match your needs and goals. The Activit Metabolism Formula and Activit Body Toning Formula both have safe and natural herbal ingredients, but each has specialty added ingredients to best work with your personal needs. By taking an Activit daily, you can excel at your health and fitness goals and feel great!